Not long ago several of us were discussing the notion of "shop local" for Christmas. I'm all for it ... except when I'm not. There are so few stores in this Mayberry that the people on my Christmas list are at extreme risk of getting tractor parts (we have two tractor places) or a can of Cheez Whiz (we have one—yes, one—grocery store, and Cheez Whiz is among its more upscale offerings). But I recently discovered a delightful spot right here in historic downtown Orange, Virginia, that has all the things that make me fall in love with a brick-and-mortar shop. 1. Hands-on owners who handpick each item for their shop with impeccable taste. 2. The wares are stylish without being remotely snooty, and the same can be said of the owners. 3. Attentive layout. Every single object is enhanced by its neighbors, and you can tell care and thought went into all the displays. It's like a party for the eyes. If you're in Orange and looking for a lovely spot to shop, I highly recommend The Corner Shop at 173 West Main. They have a handsome online shop as well. We now return you to our previously scheduled message. We've recently been asked: If we're fans of shopping online, why don't we ship worldwide? Simply because we can't guarantee a piece will arrive in, say, the Republic of Georgia, in a timely fashion and in the beautiful shape in which it left here. We want our clients to be thrilled with delivery and condition, and if we can't quarantee that, well. But please rest assured, all our beyond-borders friends: We've got nothing but love for you, and if we could safely ship to you, we would. In a Tokyo minute. Back after a too-long hiatus imposed by publication schedules. But just because I'm quiet on the online commentary side doesn't mean I'm inactive on the seek-and-ye-shall-find hunt. You know, for the most part I have no problem putting items I love up for sale --- in fact, I revel in it because it's always delightful to connect a collector with a sought-after piece. But every so often I run into a piece that gives me pause. I ask myself: How much do I love it? Next: Can I easily replace it? And finally: Can I actually use it? If the answers are "Lots, no, and yes," it sometimes stays here, if only for a short while. 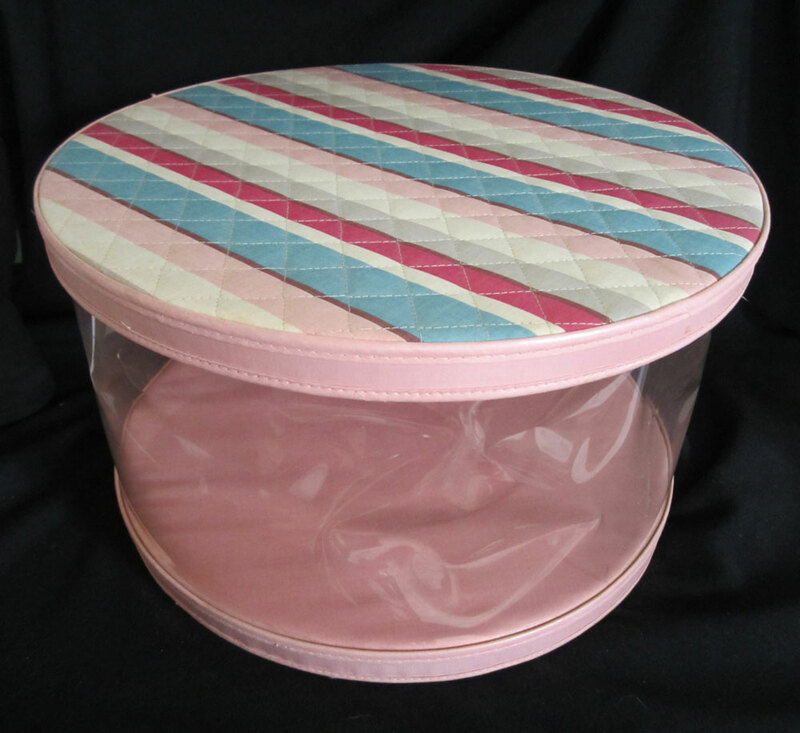 This piece got the "Lots, no, and yes" responses: a vintage vinyl-sided, quilted-top hat box in quitessentially mid-mod aqua, pink, and gray. Love it. If you do too, well, I like your style. I love dainty porcelain cake and pie pedestals. There's something so throwback girly about them, not to mention that they're also practical: With judicious use of them as serving pieces, you can nearly double the surface area of a buffet. This brass example, however, is not dainty. It doesn't look as if it ever even wanted to be dainty. It's so sturdy that is nearly cries out for hard work, which is what I gave it. 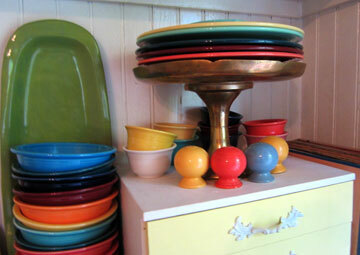 If you're fond of large pasta platters, this is the perfect way to stack and store 'em without losing precious cabinet or display pace. My husband laughs at me. Sometimes he quietly snickers, and sometimes he laughs so loudly that caribou somewhere in Saskatchewan lift their majestic heads and think, What's so funny? But occasionally, I get the last laugh. We were poking around our attic, which contains the detritus of the five generations of families who have lived in this old barn of a house, and I spied a vintage wrought iron LP rack. "That," I announced, "is getting upgraded to the kitchen." I hauled it downstairs with my husband trailing behind me, saying, "What good will that do? It's just a space-taker." No, it's not. 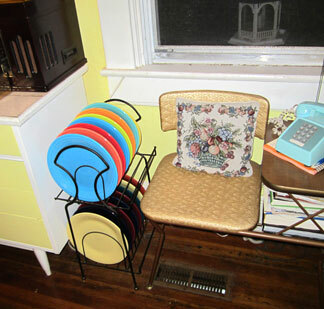 Next time you see one of these babies for sale, consider repurposing it as a rack for your retro dishes. It works beautifully. 2.20.2012 Okay, who ordered the Freight Train with a side of What In Hell Was That? If one more person tells me they want to feel an earthquake, I'm going to secretly turn their clock-radio alarms up to warp 10 volume and train 40 grizzly bears to repeatedly jump up and down beside their bed all at once. Ear-splitting noise and weirdness-abounding movement, that's what it's all about. Nah. I'm not really going to do that. Seems like too much trouble, what with rounding up the grizzlies and all the treats involved in training them. But my point stands. No matter how elementally exciting it sounds, you do not want an earthquake, and I've got the plaster cracks and broken glass to prove it from when a 5.8 rattled my fillings loose last summer. How did I spend the earthquake? 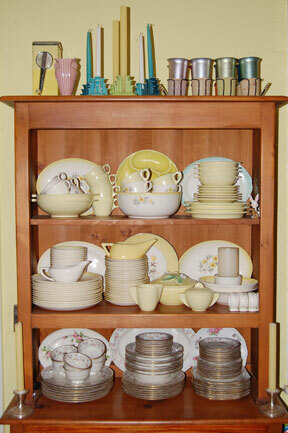 Determinedly batting back from the edge all the collectible glassware and china in an open shelf. I didn't save everything in the house (as if), but I saved that one little corner, and it was worth it. I know it was against all the rules of earthquake preparedness and reaction, but who knew central Virginia would become the eastern version of southern California? Had it been any worse, they'd have probably dug my body out from the debris and my corpse would be cradling a pristine Blenko decanter. "Well," the first responder would say, "she's a goner, but the glass looks intact." The second would say, if he had a lick of sense, "I'll give you $85 for it." I don't have any before images of the open cabinet I was trying to shelter from damage. I do have an after. The glassware is outta there and is now on more stable surfaces elsewhere. Moved to the front are vintage plastics (that's vintage yellow Boonton plastic in the front of the second shelf and some of the upper), and what is breakable and shakeable and slideable is anchored with museum putty. Thank you, earthquake-savvy sister Lisa for giving me museum putty for Christmas. Who knew it would turn out to be one of my favorite presents of all time? "How do I know?" Whitney Houston sang. Well, I can't tell you how to know if he really loves you. But I can tell you how to know if something is Bakelite—or at least I can try to. See, for me it comes easily. I've got Bakelite nose. I once got in my car on a warm day and thought, What is that smell? Then I cracked up when I realized that it was from the full sleeve of now-warm Bakelite I was wearing (but of course). By the way, Bakelitespeak full-sleeve is different from Tattoospeak full-sleeve. I had colorful bangles going from wrist to nearly elbow, all making that pleasantly chunky *thwunk* noise when they met one another in movement. Rare is the piece that is on an original sales card that says it's Bakelite. Or in this case, transparent Bakelite that was marketed as "Prystal." (Get it? Plastic + Crystal = Prystal. This piece was originally clear but has oxidized to a soft yellow.) Usually one has to go at Bakelite proofs in a more hands-on fashion. 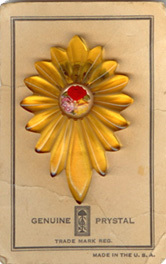 This piece is from my collection of my favorite Prystal motif with the flowers under goofus glass. Okay, take a piece of known Bakelite. Rub your thumb hard and briskly against it for several seconds, then quickly smell your thumb. Get the formaldehydish whiff? 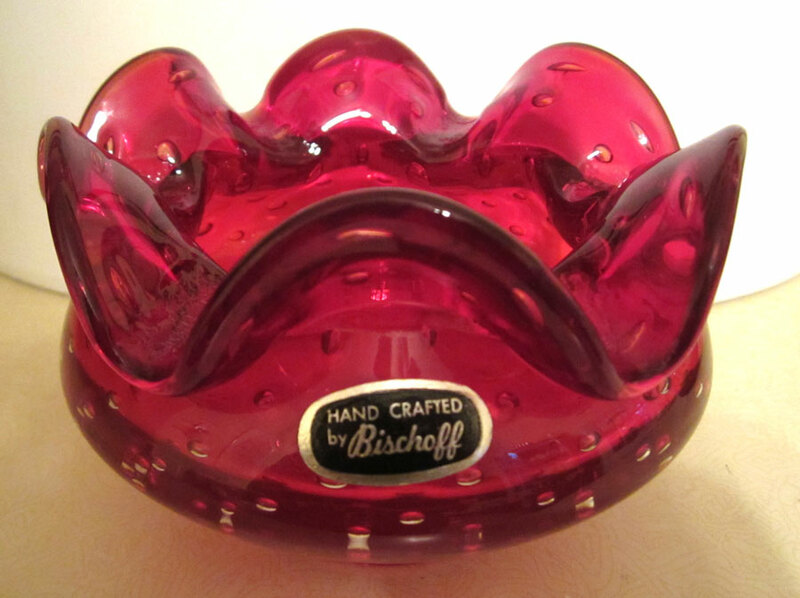 That's the beloved smell of Bakelite. I like it better than Georgio's Red Door. Actually, I like anything better than Georgio's Red Door, having been stuck in an elevator with a woman who apparently poured a bottle of it over her head, but that's a blog for another day. If your nasal passages are impaired or you've just never had a good sniffer, I find the best fallback is the polishing compound Simichrome, which will produce a yellowish residue on a white cloth when applied to Bakelite. But some antiques shop owners may take exception to this application in their shop, and who wants to have a jar of polishing compound weighing down her handbag? Another approach is sound oriented. When two Bakelite bangles are tapped against each other, there's a very distinctive thwunk. Not click. Not clack. Thwunk. It's got a certain amount of authority to it. It doesn't hurt to wear a couple of Bakelite bangles when you're out antiquing—you have your own auditory demo pair right with you. 1. If you see seams in the plastic, it is not Bakelite. 2. If it is white or pink or baby blue, it is not vintage Bakelite unless it has been reworked, in which case it should be sold as such. Several artists are doing magnificent work with old/new Bakelite, but those pieces are pricy, and legitimately so. 3. If you see a white residue around the carved lines, it may be what is known as fakelite. Be extremely cautious about such pieces. But really, I think the best approach is to develop Bakelite nose. The nose knows, and it goes whereover you do. Oh, and my strong recommendation is to avoid any purported Bakelite item that is said by the seller to have "passed the hot pin test." Ye gods. So-called hot pin tests may be somewhere down there around Georgio's Red Door, both destined for the Hell Where Bad Ideas Come From.